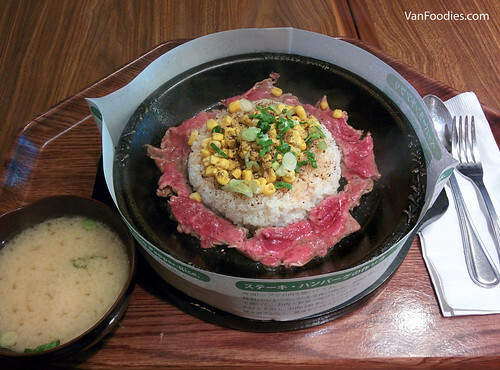 Pepper Lunch opened its first Canada location in Richmond earlier this year. When it first opened, there was usually a line-up, so it took us awhile before we finally avoided the line-up and checked out the restaurant just a few weeks ago. 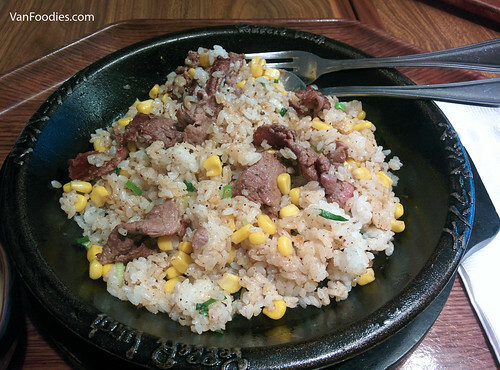 Pepper Lunch is a DIY quick service concept and the menu is relatively straightforward. Everything on a sizzling pan. Meat with rice, or just meat, served on a hot sizzling pan and diners have to cook the meat to their heart’s content. It reminds me of Stonegrill except this is a more casual meal. As first timers, we asked the staff for ideas and they suggested that we tried its signature pepper rice. And we did. For an extra $2.75, I made my Beef Pepper Rice into a combo so it also came with a drink and miso soup. There was a good amount of thin beef slices, but boy, did they cook fast. It took no time to cook the meat, so I had to stir quickly to mix everything (meat, rice and loads of corn kernels) together. 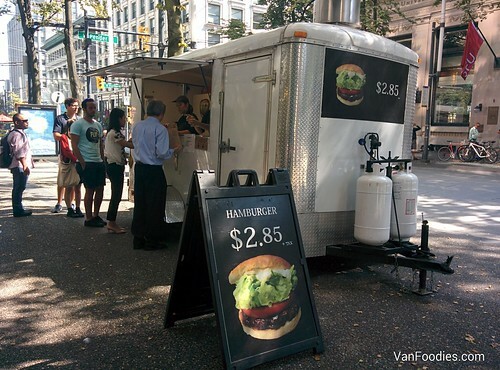 Earlier this year a mysterious food truck showed up at the corner of Granville and West Pender, selling just two things: hamburgers or cheeseburgers. The truck didn’t seem to have a name, so it has just been called 2.85 Hamburger because, well, that’s how much it costs to get a burger there. Word has spread and many people have gone. I finally decided to give it a try. And yes, there are only two items. 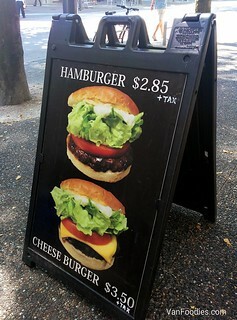 $2.85 for a hamburger or $3.50 for a cheeseburger. Tax extra. I ordered the Hamburger and it came to $3 after tax. 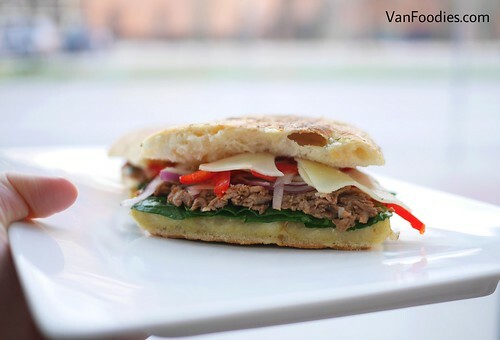 I don’t eat out fast food very often; but when fast food joints release interesting menu items, I’m often intrigued and want to give it a try. Two recent items were Wendy’s Pretzel Burger and Tim Hortons’s Maple Breakfast Biscuit. I’ve always been a huge fan of brioche buns, but lately I’ve found a new love in pretzel buns. Pretzel buns, not pretzels. In contrary to the eggy flavour, slight sweetness and pillowy texture in brioche buns, I also quite enjoy the slight saltiness and chewiness in pretzel buns. Traditional German pretzels are just too hard and chewy for my liking. That being said, Prohibition Tasting Room’s Pretzel Knots are also up there on my “have again” list of pretzel interpretation. 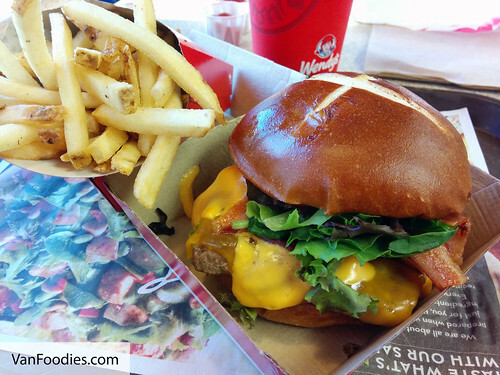 Not trusting burgers at fast food restaurants, Wendy’s Pretzel Bacon Cheeseburger, to my surprise, was quite good. Patty was of decent thickness, still juicy; I was worried that the bacon strips would be cooked to death, to extreme crisp, but they were still moist and added oily dripping mess to the burger. Pretzel bun was soft with a bit of a chew. By the way, you know how McDonald’s burgers look nothing like what they show in pictures/ads? My burger looked just like what they have on the website – now that’s impressive! Overall, a burger that I would actually eat again, and Mr. concurred. The contest is now closed. Thank you for entering. We will draw a name and announce the winner soon! 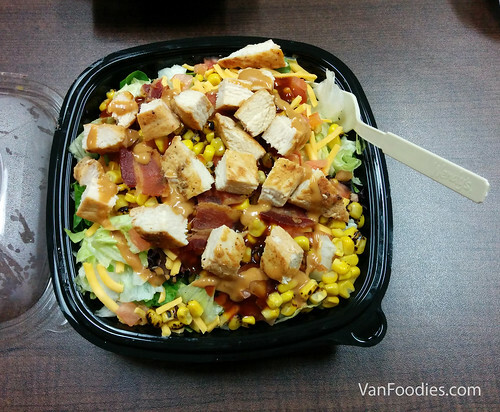 Wendy’s Canada recently added 3 new chef-inspired flavours to its permanent salad menu: Asian Cashew Salad, BBQ Ranch Chicken Salad and Taco Supremo Salad. To be honest, my guilty pleasure fast food joint is McDonald’s, so I rarely go to Wendy’s. But frequently seeing its commercials on TV and learning about this new line of salads, their food doesn’t look half bad. I was intrigued. That’s why when I was offered to try one of the salads, I decided to go for it. 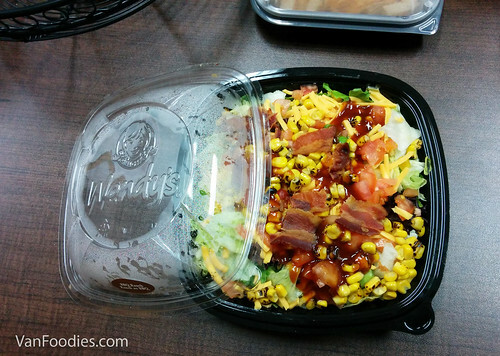 This full size salad was huge! 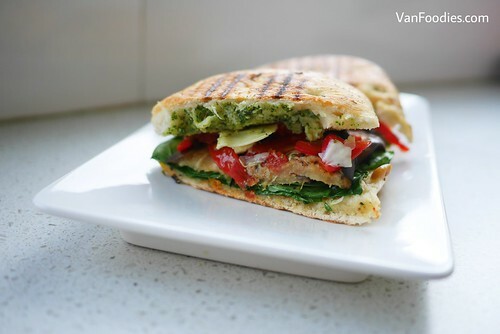 It’s packed with lots of ingredients: roasted corn, tomatoes, shredded cheddar, a blend of lettuce and a whole grilled chicken breast. I was glad to see that the greens were not wilted and everything tasted fresh. There was a barbecue sauce drizzled on top of the bacon pieces, which was a bit sweet. Combining with the BBQ ranch dressing, which also had honey and brown sugar, the sauces on this salad were more on the sweet side for me. Therefore I would recommend starting with a small amount of dressing then add more as needed; otherwise, it may get too sweet and you can’t revert it. For $8.49 I thought it’s not too bad as a lunch option. Looking at the nutrition details, though, the BBQ Ranch Chicken Salad has higher calorie and sodium count thanks to the addition of bacon. The sacrifice you have to make for something good haha. On the other hand, the Asian Cashew Chicken Salad is lower in calorie and sodium, and with the Asian spicy flair it sounds like a decent choice. I might give it a try some other day. Going on another food truck adventure with colleagues JL and JN, I convinced them to check out one of the newer food trucks in the city, Beljam’s Waffles. Suggested by its name, this truck is specialized in waffles, but not just ordinary waffles — they are waffle cones. No, not the kind we use for ice cream cones, think breakfast waffle in a cone shape. The menu is pretty simple, a few items that are more breakfast-themed, a few savoury items for lunch/dinner time, and a few for desserts. With the exception of a couple, everything is presented in a waffle cone. This is probably a sign that I don’t eat enough fast food. I never knew there’s a secret menu at every restaurant. Not until I learned of this secret menu item at Triple O’s, mentioned it to Mr., then I finally realized the power of customization at restaurants. You mean, I could’ve ordered two pieces of chicken in my McChicken this entire time? I have missed out a lot all these years!! In celebration of White Spot’s 85th anniversary, Triple O’s has introduced a secret menu item — the Triple Triple Burger. I was offered the opportunity to give this a try, but knowing that it’s one decadent item, I invited TC to come along and split a combo with me. Off its regular menu, one can order a Double Double at Triple O’s: two beef patties, two slices of cheese, and two pickles topped with its famous Triple “O” sauce. Then what is the Triple Triple? It’s Triple O’s biggest burger yet. It’s a 3/4lb burger made with — you guessed it — triple beef patties, triple cheese, lettuce, tomato and Triple “O” sauce topped with triple dill pickles. You get why I had to split the burger with TC now?